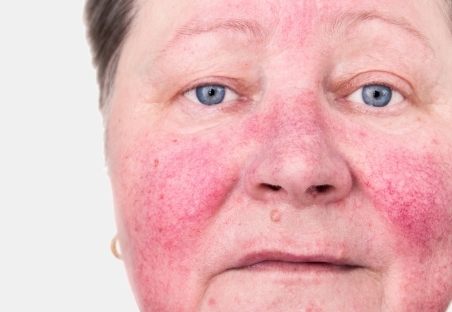 Rosacea is an inflamed rash that affects the central part of the face. Its severity can range from red blotchy skin to lumpy thickened skin in long-term cases. It's more common in people with fair skin. We don't know what causes rosacea but doctors think that it's caused by an inflammatory immune response. Avoiding sun exposure, hot spicy foods, too much caffeine, alcohol and overheating can help reduce the redness. Certain types of antibiotics can be used to treat rosacea. There are also some creams that can help mild cases. Information about the causes, features, symptoms, diagnosis and treatment of rosacea.